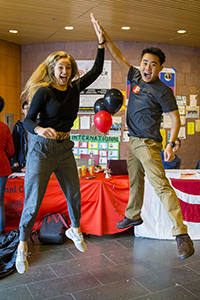 Grinnell’s second annual Scarlet & Give Back Day, held April 7, set a new, one-day record for the number of donors to the College: 3,578, up from 1,922 in 2015. At 6:08 p.m., donor number 2,000 made a gift that unlocked the $1 million challenge gift from an anonymous donor. A second challenge was issued by the same donor — an additional $100,000 to be released if another 500 donors who had not yet given that day signed up. That challenge was also met. Total gifts, including the $1.1 million challenge, came to $1,384,553.48. One technique that worked well last year that was expanded further this year was the use of “celebrity calling,” says Mae Parker, director of annual giving. Grinnell’s celebrity callers this year included past and present College presidents George A. Drake ’56 and Raynard S. Kington. Beloved faculty and staff members including Wayne Moyer, Dee Fairchild, Emily Pfitsch, and Jenny and Luther Erickson also took pledge calls, as did Angela Onwuachi-Willig ’94, Alumni Council president-elect. New activities on campus included an ice cream social and a person cavorting in a squirrel costume. Aamir Walton ’15, assistant director of annual giving, and Greg Ruzich ’16 both dressed up as Scarlet the squirrel for part of the day and asked Grinnell trivia questions while giving students rides across campus on a golf cart. One of Walton’s favorite questions: “How many varsity sports teams does Grinnell offer?” The answer: 20 total varsity teams, and they’re split evenly, 10 male and 10 female. Nicolette Musachio ’19 and Bryce Lew ’19 getting some air. Walton also “acted like a squirrel,” he says. He’d scamper from behind trees to give out candy and stickers. “It was playful,” Parker says of the squirrel costume. The number of student, faculty, and staff donors more than doubled this year compared to last year. Parker attributes the student numbers (381 gifts made) to Michelle Czarnecki, assistant director of student programs. Czarnecki has helped raise the awareness of all elements of philanthropy among students through her work with the Student Alumni Council. Parker says progress has been made in giving at Grinnell. “We can actively see and touch the results of our efforts,” she says, but adds there is still much they want to do.